The desert tortoise has a large, domed shell with no easily recognizable pattern. When it is young, its shell is a light brown or tan hue, but the color changes as the tortoise grows and generally darkens into a dark brown or gray by adulthood. However, the underside of the average desert tortoise's shell is usually a different color than the top; it often remains yellow or light brown for life. The desert tortoise spends a lot of time digging in the hard desert earth, so it has long, sharp claws and its front limbs are coated in a protective layer of scales. 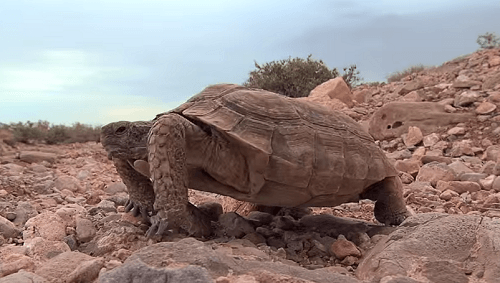 These scales make it easier for the desert tortoise to retain water. Approximately one hundred thousand desert tortoises are currently in existence around the world. This number was once much higher, but poaching and other destructive human activity has greatly decreased the species' population. Desert tortoises generally live throughout the desert in bush scrub habitats. They are common in many parts of the United States, scattered throughout the Mojave and Sonoran Deserts in the states of Arizona, Utah, Nevada, and California. Desert tortoises are herbivores; they do not eat other animals, but rather survive by consuming plants. Because desert tortoises are, true to their name, native to the desert, their diet consists of foods which can easily be found in a desert habitat. These foods include various types of vegetation which can be found in the desert, including flowers such as the primrose, hibiscus, and dandelion. Cactus, which is very common in the desert, is also a preferred treat for the desert tortoise. Desert climates are very dry and hot. It doesn't rain very often, and water is often hard to come by for long periods of time. Over the millions of years it has been in existence, the desert tortoise has adapted to this lack of available water. Most of the flowers, cactus, and fruits that desert tortoises eat are filled with moisture, which the animal stores inside its bladder and absorbs over time. Incredibly, the tortoise's ability to retain and absorb water from the foods it eats allows it to survive without access to fresh water for up to a full year. Desert tortoises generally do not reproduce until they reach approximately fifteen years old. Some even wait to breed until the age of twenty. The mating season of these tortoises ranges from late summer to early fall. After mating, females lay four to six eggs at a time and tend to them until they hatch after a period of ten to twelve months. At birth, each hatchling measures only about two inches long. Desert tortoises are common pets, especially throughout the United States. They need to be kept outside in a climate which is in accordance with that of their native habitat. The dry, hot weather of California, Arizona, and other states with similar weather is acceptable for this type of tortoise. The desert tortoise requires a large outdoor space, such as a fenced-in backyard, to roam and should be provided with multiple artificial shelters in order to find relief from the hot sun when needed. They also need sufficient natural shade from trees and abundant grass to munch while they roam their enclosure. Although the water-retaining capabilities of desert tortoises are quite remarkable, they still need to be provided with access to fresh water at all times in order to remain healthy and thrive in captivity.